A rich, deep color that immediately announces the tone of the vintage. It appears as a highly concentrated wine. The rich, complex nose confirms this impression, with a blend of black fruit and spices such as black pepper, cinnamon and vanilla. In the mouth, the attack is at once fresh and profuse. The sense of volume continues mid-palate while velvety tannins gradually develop, giving the wine its body without ever becoming overbearing. Everything is in perfect balance. A few notes of cocoa and coffee complement he broad aromatic palette right up to the prolonged finale, supported by extremely mature tannins. While the pleasure it procures may tempt some to drink it young, I suggest waiting a few years. Indeed, everything indicates long and propitious aging. The wine has a deep colour and so far, shows no trace of evolution. The nose is highly complex, a blend of fresh berries with delicate notes of vanilla and caramel. On the palate, its roundness and smooth body immediately impresses. The fruity and spicy flavours continue to develop with no harshness present. This wine is superbly balanced and clearly reflects its origins. The gentle elegance makes waiting a challenge but there is no doubt that this wine has everything it takes to age beautifully and for many years. 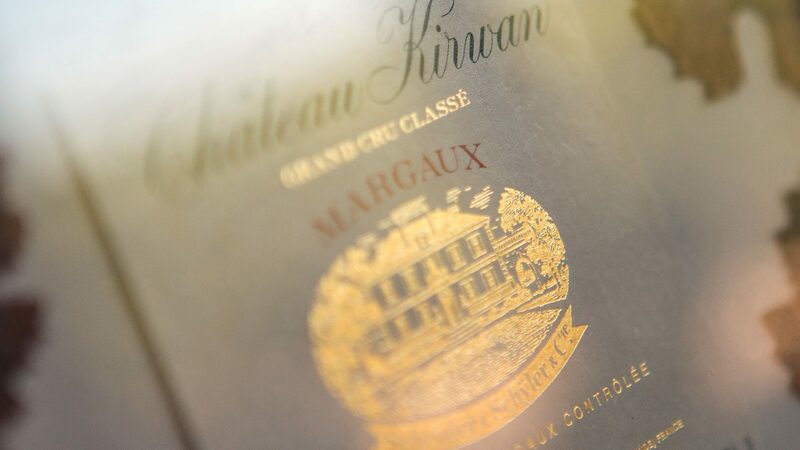 On the nose, Château Kirwan 2013 is open and seductive. It emanates exquisite notes of red and black fruits such as cherry and black currant. Sweet spices round out a particularly fresh and delicate bouquet. On the palate, it exhibits astonishing freshness and balance. Its constitution is average, but the wine is gourmand and particularly flavorful. While it does not possess great aging potential, it will please lovers of elegant wines for the next 15 years. The wine’s deep and brilliant ruby red color reflects a nose of black and red berries – cherry, black currant, blueberry, enhanced by aromas of spices, pink peppercorns and vanilla. This vintage has a strikingly tactile quality; it starts out mellow, then offers the taste buds a rich body, with nearly imperceptible tannins and an acidity that perfectly balances out its silky texture. The finale blends hints of perfectly ripened cherry and subtle roasted notes that continue to caress the palate. Connoisseur or novice, 2012 is a year for all to enjoy. Aging has been extremely positive for this vintage. The color has deepened and given way to more complex aromas. The bouquet combines black fruit with a variety of spices such as vanilla, liquorice and cinnamon. Here we discover the beautiful aromatic palette of the 2011 Cabernet Sauvignon. Yet the evolution is most striking in the mouth. The wine gained body and fleshiness. It fills the palate. Notes of deeply ripened black cherry mingle with cocoa and mocha. It has a smooth finish, coating the palate with velvety tannins. The wine unfolds like lush velour fabric. This very “tactile” wine engages all of our senses and promises fine sensations in the coming years. 2010 comes out as an extremely complete wine: its freshness and aromatic purity bring an additional touch of brilliance to its velvety richness. Its superbly delicate nose, the savory balance it presents in the mouth and its intense finale all contribute to making this wine a perfect expression of the Kirwan terroir. In addition to the indulgent quality of its remarkable fruit, 2010 offers great aging potential. 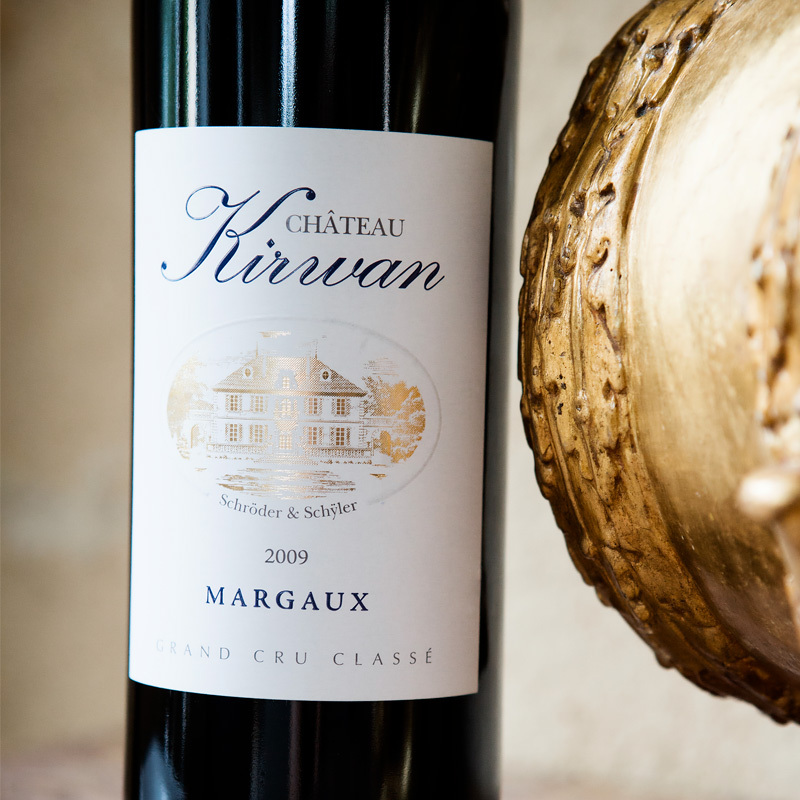 In the case of Kirwan 2009, the fruit dominates, with robust notes of black cherry. The attack is soft, round and juicy in the mouth. The flesh has a velvety character that blankets the palate while aromas of pepper, cedar, cocoa and light roasted coffee complement the pervasive fruit. Even young, Kirwan 2009 already presents remarkable complexity. The months to come will further accentuate these perceptions of volume and smoothness. As for the bouquet, it will continue to develop for many years…..patience. The wine was bottled at the end of June 2010, after 19 months of aging in barrels (including 45% new barrels). Today, it demonstrates an excellent aromatic complexity with a mélange of fruits – black currents and ripe cherries – and sweet spices, like vanilla. The attack is fresh, slightly minty, and smooth. The tannins appear progressively to give the wine body and support a long, slightly woody finish. If this bouquet already piques your curiosity, we can satisfy your taste buds, but rest assured that this wine will only improve in the coming years, for a pleasure that grows with time. Today, the 2007 has obtained intensity and a quality of fruit. On the palate, it is delicate and supple, backed by a flawless balance around silky tannins which linger pleasantly mid-palate without any aggressiveness. The finish is fresh, aromatic and smooth. Finally, this demanding vintage is an ample reward for all the efforts deployed throughout the season, by offering a wine full of balance and charm, commensurate with the know-how of Bordeaux. The 2006 vintage was very over-particular: it required the know how of both, vine-grower and winemaker. Kirwan 2006 shows fresh red and black fruit aromas on the nose and great finesse with an almost chewy texture on the palate. The wine is lively with firm and perfectly ripe tannins with a long, elegant and fresh finish -typical of the vintage. Can be compared to 1999 for its juicy fruit and to 2002 for its vitality, this 2006 vintage is definitely a nice representation of the Margaux Appellation. From birth to bottling, this vintage was always impressive. Its nose is exuberant, mixing notes of complex fruit, from spicy to exotic aromas such as mango. At mouth, the wine is full bodied and perfectly balanced in spite of the high level of alcohol. The soft tannins hit the palate and confirm that the wine is incredibly long and generous. This wine already tastes delicious, but one can bet it will develop very nicely for those who will be patient! The 2004’s has a nice deep purple violine colour. The nose displays blackberry, spices and tobacco notes. Then a full attack, a tight-knit, a silky texture on the palate takes over. On the mouth, it leaves persistent fruit and freshness.. This is a promising vintage that was bottled in July 2005. Its color is deep and brilliant; the nose offers a multitude of aromas of black fruits, spices, and cedar. With its beautiful density, the mouth is astonishingly supple, opulent, and unceasing in its expressiveness. The tannins are still firm but are balanced with the freshness of the wine. Patience is a virtue deserved by this great vintage for putting down. Its color is a profound purple. The scent reveals a multitude of aromas of black fruits, spices, and cedar. The taste is very structured, powerful with strong tannins that soften with time. Very lovely and persistent finish. This great wine is made for cellaring. It is slowly following its evolutionary path. It oscillates between periods of closure and openness during which one discovers a vast aromatic palette filled with a mix of black fruits, the scents of woody underbrush, and hints of minerals. The tannins have a strong presence and the acidity provokes a fresh finish in the mouth. Its anticipated maturity is without a doubt in 15 to 25 years. A charming vintage playing hard-to-get! The wine already offers a fresh bouquet of red fruits, developing amply in the mouth: supple and rich. Its lengthy finale, and the presence of a pleasant balance of acidity and tannins, indicates that it has not yet reached its full potential. This great wine slowly follows the path to its evolution; it oscillates between periods of closure and openness during which one discovers a large aromatic palette filled with a mix of black fruits, the scents of woody underbrush, and hints of minerals. The tannins are strongly present and promise good ageing potential.de. This is charming vintage that opens more quickly than its siblings. Today, its color bears a pretty ruby pigment, the nose is very subtle, with hints of plum and undergrowth. It exhibits a soft structure and refined tannins. It can therefore be appreciated today or can be left to mature for another 3 years. Simply a great wine ! Deep color of a ruby purple, the nose dominated by the scent of black fruits and spices. A remarkable balance of taste. The tannins begin to blend. The structure is silky and balanced with a lovely acidity that creates a fresh finish. Very lengthy, revealing specific Margaux characteristics. Other vintages of the same caliber: 1990, 1986, and 1982.